Chase has an awesome offer. Credit card that gives you 3% back for your top 3 categories for each month. These include grocery stores and gas stations. In addition, you get $50 after your first purchase. I just signed up. This is much better than my Citibank dividends card which only gives 2% and a maximum cashout of $300 per year. I hope Chase doesn't have a limit on how much of your earned cash back you can redeem. Every year, for the first seder, we go to the shul's community seder. This year was no exception. I'm famous for bringing my own wine, always having a corkscrew, bringing my own cups, home-made morror and, for the past two year, sashimi. This year, unfortunately, I forgot my sashimi at home, though one of my friends brought some cured salmon, a recipe I replicated for the last two days. We had a family in shul, they stopped coming a while back, where the wife was quiet known for her frumminess and her isms. This year, they decided to join the seder and were sitting right behind me. I overheard her asking someone else at their table to open a bottle for her because their minchag is not to open bottles. This was on Yom Tov. I just couldn't let that go. I turned around and asked her why would she say something so ridiculous as not opening bottles on Yom Tov?! She told me that they used to go to one family when they were becoming religious and that family didn't open bottles on Yom Tov and since they're following their minchagim, they also don't open bottles on Yom Tov. I told her a story of mine about me and another guy going to a shabbaton. Our host was this psycho frummie bal teshuva who kept telling us how humble he is by become frum, even though his father's a millionaire. He spent the whole shabbat telling us about how humble he is. He also decided to educate the stupid russkies about hilchos shabbos. Apparently you're not allowed to remove a dirty plate from the table, unless you place a piece of bread on it. He was presenting this as a halocha. This is what you get when someone thinks that if he learns gemorah, he doesn't need to learn halochos. This guy, however, didn't have a minchag of eating suedat shlishi, even though it's in gemorah too. I told the woman that the point of my story is that there are minchagim and there are personal chumras, frequently based on ignorance. A minchag is something that a lot of people do and it's generally accepted, this is quiet the opposite of a personal chumra. She told me that it is so a minchag and since their friends have followed it, they will follow it too. Incidentally, I'm pretty sure her rabbi will disagree with her on this. This quiet pissed me off and I told her that her friends don't know halocha and based their chumra on ignorance and that she doesn't know halochas either. She harrumphed and turned to her table. Opening bottles on shabbat is a hotly contested topic with many holding that you can and many holding that you can't. Sephardim are allowed and even by ashkenazim, many agree that if the bottle cap will be thrown away or is punctured, opening is ok. I have not heard or been able to find any opinion that says you can't open bottle on Yom Tov. Uneducated frummies will always find some way to make their life difficult. 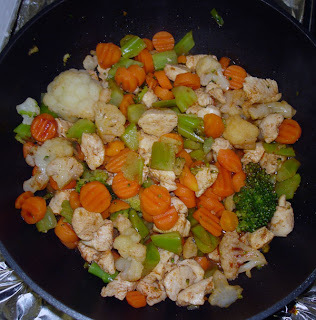 Wok + chicken cut into small cubes + bag of frozen California style vegetables + BBQ sauce = Pesach Stir-Fry. Another one of Shlomik's favs. He loves the tank in this one. I use a small wok for most of my Pesach cooking. One great way to use it is for chicken cut in 8 or chicken thighs. The wok is just the right size for 4 chicken thighs. I like to use apricot or cranberry based chicken sauce, half a bottle or about 9 oz. To shorten the cooking time, cover with a narrow, tight fitting lid that should rest about half an inch above the chicken. We were watching Nana-TV today, the episode where Hachi and Nana go to see a Trapnest concert. During the song, subtitles in romanji and English were displayed. Though I noticed this before, this time I really started thinking about how much Japanese language naturally fits singing and karaoke. Karaoke was created in Japan. I believe that the structure of the language plays a big part in Japan being the origin of karaoke. Japanese language is syllabic, all words are made up of single consonant and vowel pairs, occasionally, a consonant is added at the end of the word. This type of structure allows for songs to be sung either fast or slow or syllable by syllable and to have any individual syllable be stretched out and still sound normal. Japanese alphabet, kana, is also syllabic. Instead of each symbol representing a letter as it does in other languages, it represents a syllable. As opposed to English, kana is a lot easier to read. Kana consists of about 50 characters. While in English you need to know how to pronounce letter combinations and words you don't know may pose a problem, in kana, you're just reading individual syllables which, in turn, form words. In karaoke, either the word or syllable is highlighted. In English, the syllable can be between 2 and 5, or more, characters in length, in Japanese, it's just 1. Even when displayed in romanji, Japanese words written with English letters, words are easy to read and pronounce even though you may not know how to read Japanese or know what the words mean. Here's to Daisuke Inoue, Kanpai! I just got a huge sense of accomplishment. For about two months I wanted to install gotalkmobile on my phone. I got a Data Error 905, Attribute Mismatched on each jad link. I got a can't display content error on each jar file. Copying the files to PC and from PC to the MicroSD was also fruitless. I tried contacting tech support. Had to wait one month for a useless reply. Finally, remembering a post about incorrect info in the jad, I decided to repackage it myself. One of my friends helped me find a jad generator, JADgen. The error was in the manifest.mf file. There were 4 lines that wrapped to next line and were saved that way. After putting them back on their respective lines and changing the install url to that of my site's, I generated the jad file and uploaded both files to my site. This time, the install ran without a hitch. The install problem occurred on my Katana DLX. If you also get a Data Error 905, Attribute Mismatched, you can download the fixed version from my site. If you get this error from another application, feel free to contact me and I'll help you repackage the file yourself. If you've watched Fitna on LiveLeak, you may be in danger. Al Qaeda operatives hacked LiveLeak last night and have obtained IP lists of people who watched the video. It has become known that there are also secret Al Qaeda operatives employed by many internet service provider companies. Several have been caught but more are still operating. They have been able to match the IP lists to ISP's lists of users and addresses. LiveLeak, working with government agencies and ISPs, have posted a list of affected ISPs. If your ISP is on this list, it's important that you contact your local law enforcement immediately. You can view the list here.